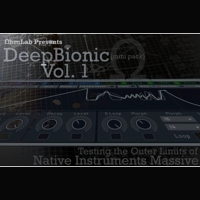 DeepBionic Vol. 1 Mini Pack is the first in a line of NI Massive preset collections that aim to push the envelope of what people heave come to expect from this amazing synth. Exploring the outer limits of sound design with a synth this versatile is really a never-ending journey, so join us as we leave the boundaries behind and find new ways to create music, atmospheres, FX, soundscapes and instruments that may leave you wondering how they were ever conceived. This first installment in the series brings you blips, plucks, noises and bass that can be twisted and stretched in ways that will help bring new inspiration to your projects. It also features a couple of intense soundscape pads that are seemingness endless in what they can produce and where you can take them. From haunting and chilling to cute and fun, the sounds can considered avant-garde one moment and pop the next. The audio file enclosed shares a small sample of each of the five sounds, without any kind of processing applied outside of Massive. The only parameters tweaked throughout the recording are the Macro controls. Each preset, as with all OhmLab preset releases, has 8 fully functional and professionally programmed Macro controls to give you more control in more ways over how you use and interact with these sounds. Thanks for checking out the sounds!